One thing I told my husband to build me this summer is a raised bed. We do have the garden where his Grandmother used to plant her vegetables, but for some reasons my plants never grow as good as I wanted them to be. I have a strong feeling that it might need more sunlight, which is better now that we cut down those trees that blocking the sunlight. Another thing is that the ground is 101% gravel. Imagine it must be a very strong roots that can survive to grow in a gravel ground. I get dismayed after the 2 summer season that I have never had a successful planting. Some vegetables grew more and actually bear fruits others could not even grow bigger due to the lack of sunlight and may be due to the gravel ground. I told my other half, that if we don't make a raised bed, and no enough sunlight in where the garden is located, I will stop planting. I'm glad he listened, after spending few bucks on it, he finally built me a raised bed. 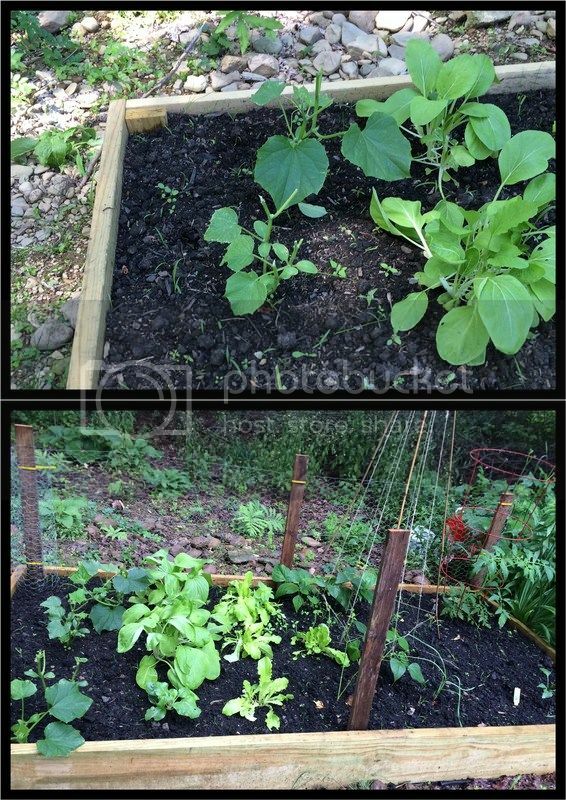 Put garden soil, manure and of course top soil. I can smile now while watching and checking our plants, for it to grow in time, some were ready to picks while others need to wait a little bit longer. Next year, we plan to build 2-3 more raised bed and get rid of those big branches that blocks the sunlight in that area.